I recently wrote about my year doing CrossFit A and since that year was followed up with a year of Orangetheory I thought you may be interested in that experience as well. You see, I live in a gym-desert. There are no options near my house – a residential area of south Seattle – and there are few options near where I work in Pioneer Square. There’s one old, run-down YMCA but I just need energy in my workouts. So when Orangetheory opened up downtown, though it was over a mile away, I signed up as a founder at their location. I did Orangetheory for a year and this is what happened. I can see why; what I like about it is that it got me running when normally I wouldn’t. They mix each workout up so much – going up hills, going “all out” (at fastest speed), taking a walking break – every day is different. It can get even a non-runner running. And you can always power walk if needed. In the weight room, the moves are pretty standard: lunges, squats, deadlifts, push-ups, bicep curls, tricep extensions, plank and other abs, TRX straps, bench presses with free weights that kind of thing. Orangetheory utilizes heart rate monitors that pop up on a screen and the idea is that when you’re training in the “orange” zone, you’re going to maximize the after-burn, dipping into energy stores well after you walk out of the gym door. When I got tired of Crossfit, I needed new fitness motivation so I did Orangetheory for a year and this is what happened. I enjoyed my time in OT and it kept me engaged for a while. I like that it got me running, too – that was a fun challenge. It’s not something that I chose to stick with long-term but I’d recommend trying it if you’re interested. Definitely take the time to go early and meet with a trainer who can get you oriented. On your first class, just take it slow and don’t ever try to lift weights above your comfort level. Stay hydrated and fuel yourself properly. Meeting with a Registered Dietitian can really help you understand how best to eat pre- and post-workout when starting a program like OT. Let me know when you try it! 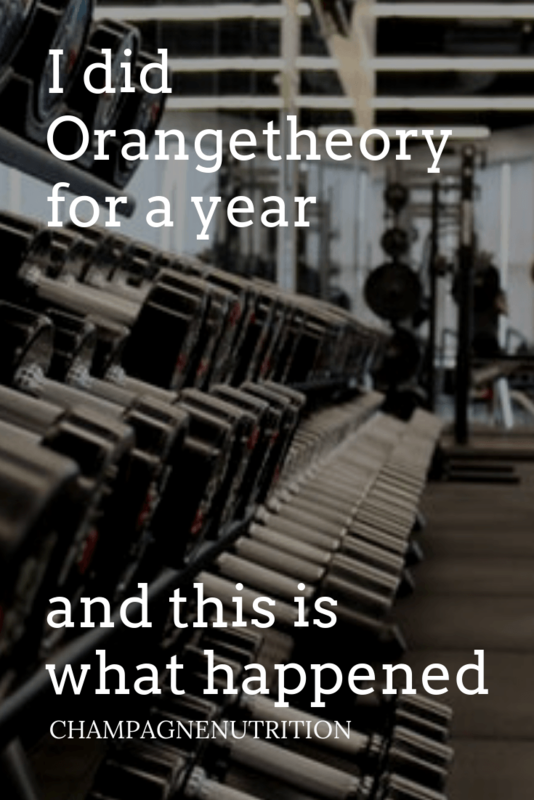 The post I did Orangetheory for a Year and This is What Happened appeared first on Champagne Nutrition.